I was on my way to high school in the morning, and I was messing with my cell phone. When I looked back up at the road, I was heading straight for a telephone pole. 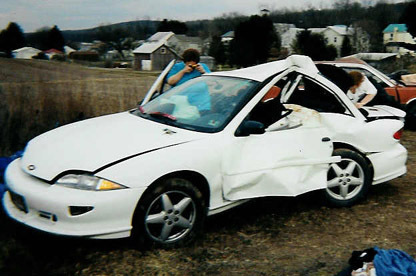 My accident happened on March 7, 2002 in a small town called Landisburg, Pennsylvania. I was on my way to high school in the morning, and I was messing with my cell phone. When I looked back up at the road, I was heading straight for a telephone pole. I swerved to keep from hitting the pole, and when I did, I side swiped it, and it spun me around and I T-boned another telephone pole. I was not hurt at all, except for a small cut on my forehead. I was not wearing my seatbelt, but had I been wearing my seatbelt, I would have been killed. Perfect example of why NOT to talk on your cell phone while driving.